Cutting-edge motor sports technology for more performance on the road. With compression and rebound stage damping, that can be set separately and independently of each other, the damper setup can be customized to your own driving preferences or vehicle changes such as weight, tire characteristics or altered vehicle rigidity. True performance optimization is only possible with this unique, patented system. For example, this allows the compression damping force to be increased and get more grip from the tires, to improve cornering behavior and reduce squat without simultaneously altering the rebound stage damping which is optimally matched to the spring rate – a scenario which results in reduced grip and the associated loss of performance. The KW coilover kit Variant 3 “inox-line” is the ideal accessory for performance-oriented drivers and tuning enthusiasts who place a high demand on sportiness at their vehicles. The dampers with their “TVR-A” and “TVC-A” technology that are separately adjustable in rebound and compression damping allow an extensive damper setup. So it is easy to directly influence the steering behavior, directional stability, tire grip and handling characteristics for a safe controllability at the limit. 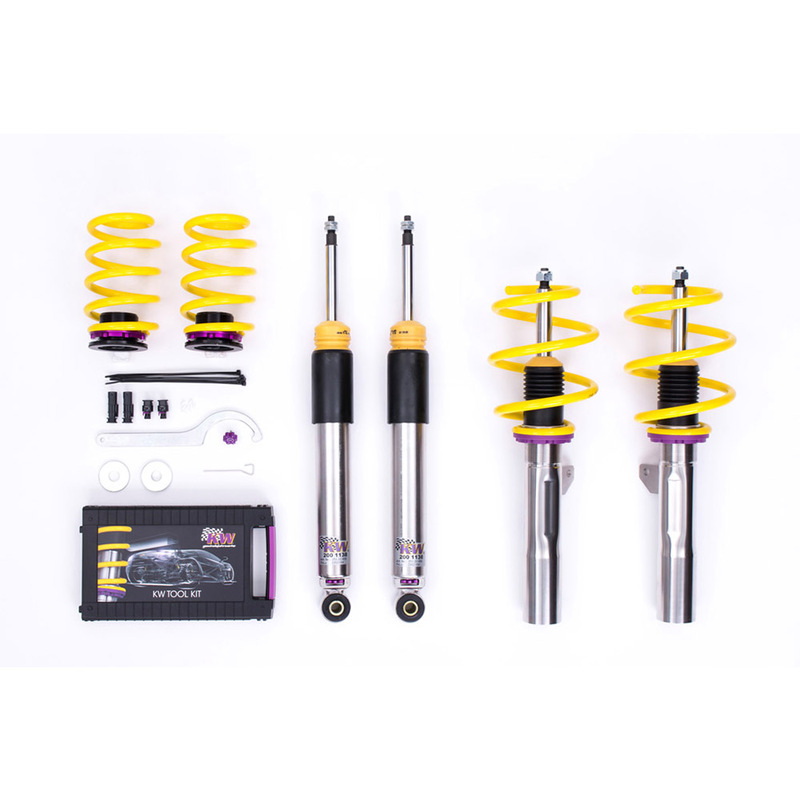 KW coilover suspensions, KW coilover springs, and KW DLC AirSuspensions allow the suspension to be steplessly lowered within the framework of the certified technical component report. For example, our Street Comfort products allow for a customized height setting with gentle suspension lowering from 10 – 50 mm, while the Street Performance products allow the maximum technically possible suspension lowering range from 45 – 85 mm, depending on the vehicle. This means that the suspension can be lowered to suit the personal needs of the user and, depending on the product category, a setting ranging from Comfort to Performance can be chosen. The rebound stage damping is precisely tuned to the respective vehicle on our in-house drive dynamics test facility, with the setting fixed in the mid range. Individual customization can be achieved in 16 precise click positions, allowing you to choose between more comfort or more body control. The two-step patented TVR-A technology allows the damper oil to flow through an adjustable, conical low-speed valve during slow piston speeds, while during higher piston speeds the main rebound stage valve opens to handle the flow of large volumes of oil. This provides major improvement in ride comfort without influencing the high-speed in the safety-relevant zone. The patented compression stage valve with TVC-A technology features two separate spring pre-tensioned valves for small and large volume flow. The compression stage is tuned to the respective vehicle type on our 7-post rig and is delivered with a mid-level factory setting. Within 12 precise clicks the adjustable compression stage valve can increase or decrease the cross-section in the low speed valve, thus providing more or less compression damping. At the same time, in the case of sudden high piston speeds, the spring pre-tensioned needle valve opens along with the spring pre-tensioned main valve to its maximum valve cross-section, to prevent unwanted progressive power surges in the high-speed range with its blow-off feature. 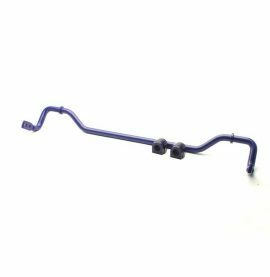 This makes it possible to brace the vehicle body better while still offering more comfort than the conventional valve technology during high wheel acceleration. The compression stage damper setting is always supplied in combination with a separate rebound setting, only one independent 2-way damper setting allows for true performance optimization. This is the high-end motor sports technology for the most demanding street and track performance customers. Two separate valves and a two-way adjustable compression stage valve allow separate compression damping changes in the low and high-speed range. The adjustments are made via two adjustment dials with click increments that feature 16 settings (with 15 clicks) in the high-speed valve housing and 7 settings (with 6 clicks) in the low-speed housing. During tuning at the KW drive dynamics test facility, the groundbreaking V4 coilover suspension is tuned to a mid-level basic setting for the best road performance with an additional recommended setting for occasional track day use. 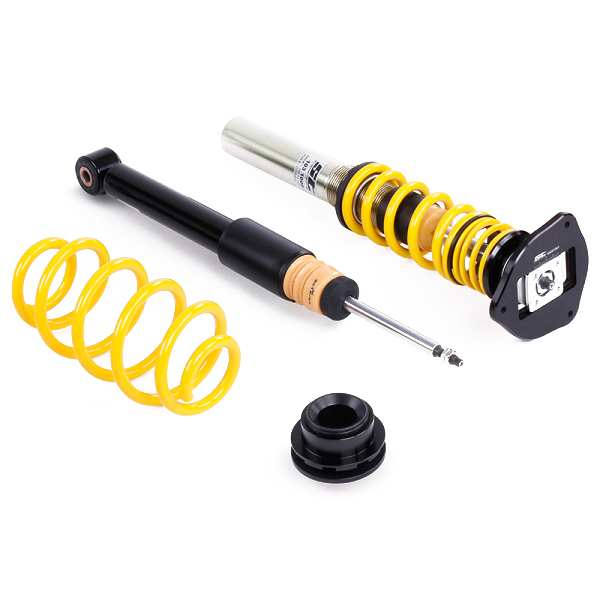 The 3A Clubsport coilover suspension is tuned to a mid-level factory setting especially for track day use, with an additional recommended setting for the drive to the race track. Starting from the factory setting, the damping can be set firmer or softer for low and high-speed. The TVCLH-A technology has a blow-off feature with large cross-sections. The resulting high low-speed forces create the best bracing for the vehicle body to keep the tires on the road in the case of wheel-induced high damper speeds (driving over curbs). The separate low and high-speed setting is always supplied with an additional rebound setting, to ensure an independent three-way damper setting. The KW coilover spring seat is made from a wear resistant and friction-optimized polyamide composite material with a stainless steel insert. In contrast to the anodized aluminum adjustable spring seats, the polyamide composite material prevents any possible oxidation. In combination with the Inox Line, this guarantees the long-term functionality of the height setting. In comparison to common coilovers, KW uses a friction -optimized and dirt insensitive trapezoidal thread that displays low adjustment forces. Its large cross-sectional area allows for a higher load-bearing capacity. 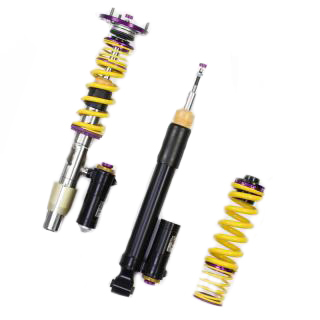 KW’s coilover suspension struts are manufactured from high-quality stainless steel that is rust-proof. In contrast to other solutions, coatings will not wear off while adjusting the suspension settings making KW coilover struts 100 percent corrosion resistant with an unlimited lifespan. Lowering the suspension using the dirt-insensitive trapezoidal thread in combination with the polyamide composite collar guarantees long driving pleasure. Even after years the stepless suspension lowering is not affected by environmental influences. The use of KW reservoirs provides additional volume for additional oil and additional cooling capacity for particularly high-stressed systems. The reservoir, which is filled with low gas pressure, can be fitted anywhere and accommodate the adjustable compression stage valve to provide the damper with more working space. Used regularly by automobile manufacturers and international racing teams, KW’s in-house 7-post drive dynamics test facility optimally tunes the KW coilover suspensions according to the design and target group. The 7-post drive dynamics test facility is essential for perfect fine tuning along with road trials on public roads and race tracks. In objective laboratory conditions, which can be reproduced at any time, we work everyday to give our customers the internationally-esteemed KW driving experience.